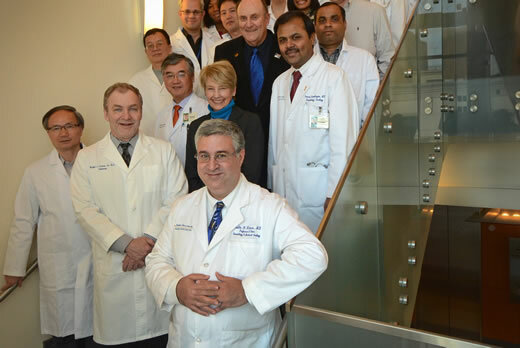 Dr. Fadlo R. Khuri, surrounded by colleagues at Winship Cancer Institute, including institute executive director Dr. Walter J. Curran Jr., who stands to Khuri's immediate right. Fadlo Khuri describes what sets Emory's lung cancer program apart from others in Georgia. Fadlo R. Khuri, MD, deputy director of Winship Cancer Institute of Emory University and one of the world's leading experts in lung and other aerodigestive cancers, will be awarded the coveted Richard and Hinda Rosenthal Memorial Award from the American Association for Cancer Research in recognition of outstanding contributions and accomplishments as an investigator in lung and aerodigestive medical oncology. The award recognizes Khuri's work for the prevention and treatment of lung and head and neck cancers. The Rosenthal Award is given each year to an investigator not older than 50 whose contributions to cancer research have led to new understandings of cancer and show promise for even greater advances in the future. Two Rosenthal winners have gone on to become Nobel Prize winners. Khuri, who holds the Roberto C. Goizueta Chair in translational research at Emory University School of Medicine and is also the Editor-in-chief of Cancer, will receive the award April 10 at the AACR's annual conference in Washington, D.C.
"As a practicing clinical oncologist and as a physician scientist, it is a profound honor for me to receive the AACR Richard and Hinda Rosenthal Memorial Award, particularly in light of the extraordinary role models who have previously received this award," said Khuri, who is also professor and chair of hematology and medical oncology, adjunct professor of medicine, pharmacology and otolaryngology. "The award recognizes work by our team of physicians and scientists at Winship Cancer Institute and the MD Anderson Cancer Center, all of which was carried out with the sole purpose of making a difference for patients with lung and head and neck cancers." "Fadlo's leadership in lung and head and neck cancer research is legendary, and he has helped advance our understanding of the nation's number one cancer killer by introducing novel therapeutic agents that have changed how people live with this disease," said Curran. "More than any other person I can think of, he has changed how we think about lung cancer – and how people live with this disease as a chronic, manageable illness in many cases, rather than as a death sentence. I am thrilled that he is receiving this prestigious national award for the tireless work he has invested in patients with lung and other aerodigestive cancers." Khuri's positive influence is felt by patients, colleagues and students says Christian P. Larsen, MD, DPhil, dean of the Emory University School of Medicine and vice president of health center integration. "Not only is Fadlo an outstanding researcher and leader, he is an exceptional and compassionate physician who is a role model for students, trainees and faculty alike." Howard Halpern, a survivor of head and neck cancer, was so impressed with Khuri that he and his wife Lynne established a $2.5 million endowed chair at Winship in honor of him. "Dr. Khuri and his team saved my life," Halpern said of Khuri. "Lynne and I can hardly express the depth of our gratitude for the extraordinary care we received at Winship." The Rosenthal award is designed to provide incentive to young investigators early in their careers. It was established in 1977 by the AACR and the Rosenthal Family Foundation to recognize research that has made, or promises to make, a notable contribution to improved clinical care in the field of cancer. Khuri was instrumental in obtaining the National Cancer Institute (NCI) designation to Winship Cancer Institute in 2009. Additionally, he worked to increase NCI peer-reviewed funding in cancer at Emory, from $7.4 million in 2000 to more than $30 million in 2011. His contributions to cancer research and patient care extend beyond the laboratory. He helped increase patient enrollment in therapeutic clinical trials from 143 in 2001 to more than 500 in each of the last three years. Khuri currently serves on the editorial board of AACR's journal, Cancer Prevention Research, and is the editor-in-chief of American Cancer Society's Cancer. He is an elected member of the American Society of Clinical Investigation. Additionally, he has received the American Cancer Society Clinical Oncology Career Development Award, the Georgia Cancer Coalition Distinguished Clinical Scholar Award and the Middle East Medical Assembly's Naji Sahyoun Memorial Award. Khuri received his medical degree from Columbia University College of Physicians and Surgeons in in 1989. He completed his internship and residency at the Boston City Hospital, Boston University School of Medicine in Massachusetts in 1990 and 1992, respectively, and a fellowship at the New England Medical Center at Tufts University School of Medicine in 1995. His award lecture, "Targeting Survival Signaling in Aerodigestive Cancers," will take place at 10 a.m. ET on Wednesday, April 10 in Ballroom C in the Walter E. Washington Convention Center.